Something a little different for today! I love accessories, whether that’s a statement necklace or a couple of stacker rings, I probably have more accessories than I do items of clothing, shocking I know. I’m officially on the hunt for a new pair of glasses. If you read yesterday’s blog post, you’ll know that I now have a job, yippie, so I can actually afford to go to the opticians and get an eye test and some new specs. I’ve been in the need of a new pair for months now and I’ve been finding it really hard to find a pair that I like but I think this Firmoo pair are really lovely! Firmoo actually have loads of really nice frames on their website and seem to have some great reviews too. All at a bargain price too, this pair are only £14.10! We all know I love my hats so this Charlotte Russe one is no exception. You can pick up a big floppy rimmed hat from just about anywhere at the moment, but I really like the thin metal band that this one has around the base, don’t you?! You can bag this online now for $25. The third item needs no explaining. It’s coffee related, enough said. Oh, it’s only £3! Well done Brandy Melville, well done. How insanely adorable is this necklace!? It’s from a store called Sugar & Vice and oh my word you have to check out their site! If laser cut jewelry is your thing then be prepared to do some spending! Asides from this perfect rain cloud necklace (£14), you should also check out their Vegan apple necklace, Antlers necklace and their Fox necklace, all adorable! I could do some serious damage on their site let me tell ya! I’ve been loving the colder months here in the UK, getting to wrap up warm in over sized scarves and jumpers, so cosy! 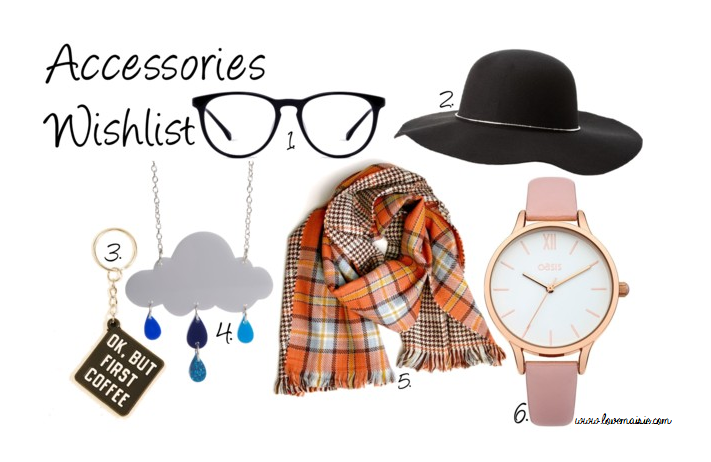 I’ve also been loving orange, so when I spotted this orange plaid tartan scarf, I knew I had to include it in this post. It’s from a store called Accessory Concierge, which I’d not heard of before, but they’ve got a load of cute pieces too! This scarf is currently available online for $30. I know all I’ve done lately is harp on about watches but this one is adorable, isn’t it? Pink and rose gold? Yes please! I love how delicate it is yet I think it’d look real smart and eye catching on! It sort of reminds me of the DW watches that every blogger under the sun is currently rocking! So there’s my little accessories wishlist! What have you got your eye on at the moment? Let me know!